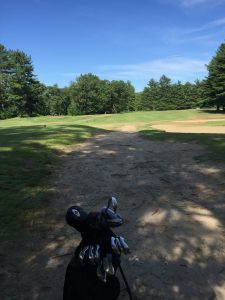 If you drive 19 and a half hours north from St Augustine (depending traffic) you will come to Angus Lea Golf Course in Hillsborough New Hampshire. 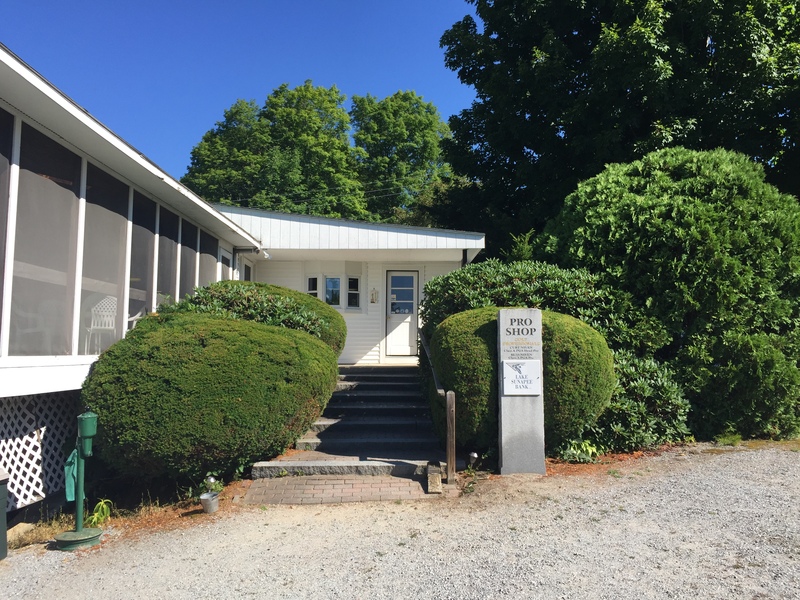 Hillsborough is situated between Keen and the capital of NH, the city of Concord, where you have bus services to Boston city and the airport. 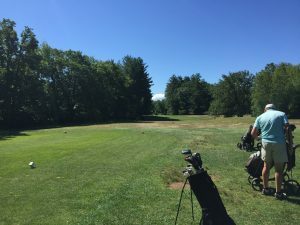 Angus Lea golf course is a nine-hole course, par 33, designed by Ed Bedell and built in 1961. It measures 2319 yards from back tee with a slope of 101 and rating: 32.8, from ladies’ tee it measures 2097 yards. It has three par 3 and 6 par 4 holes, the longest 435 yards. 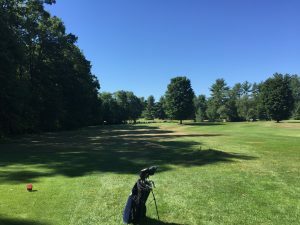 The course is in the city of Hillsborough on 126 W Main Street, and the Contoocook River is almost surrounding the course but not really in play (unless a really bad shot). 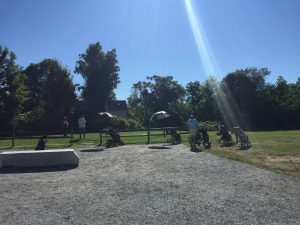 The course was in very good condition and the greens well kept. There are beautiful trees around and on the course, quite a few groundhogs, and I saw fox twice when playing. This is a course where almost everyone walks, and some of the golfers I played with 90 years plus. Staff working here is very friendly and nice, and even as a guest you feel like you belong to the club. There is a nice bar, with inside seating and a screened porch plus a small pro shop. The first hole (283 yards, par 4, touch of dogleg right) can easily fool you to think this is an easy one, but once on the green you might find out that only the first 6 feet are level and then it goes down. So many times you will see your ball landing on the green and nice and easy roll off on the back. Second hole a straight par 3 and 150 yards long, but with a green without any level spots. Third is another par three of 160 yards with trees and left side protecting the river but on the right side it is open only with a small problem of a bunker protecting the green from that side. The fourth hole has a narrow start but then it opens up towards the green. It is a decent short par 4 only 300 yards, and the green is of course not level but not too bad anyway. The fifth hole is for me the hardest hole. 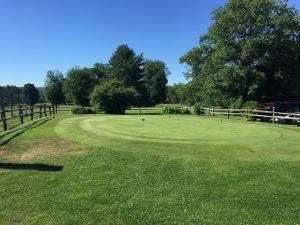 It is 310 yards dogleg left measuring 310 yards, but the first shot can’t be too long unless you have a good hook or can hit a good draw. Again, you have the trees on your left protecting the river, and behind the narrow green you also have the river after a few bushes. On this hole the ground is hard in many places, so it was sometimes hard for me to hit a clean good shot towards the green. Maybe I found this hole difficult since I use my 1 iron at this hole from tee. I do this because I like the club, and it is the club I feel I can do a draw with. For the rest of the holes I think you should go to Angus Lea and find out for yourself. They are nice holes with more or less level greens. I will be back here, that is sure. It is one of my favorite courses. Last but not least, I have played with many very nice golfers here.